This was once the Albany High School building. 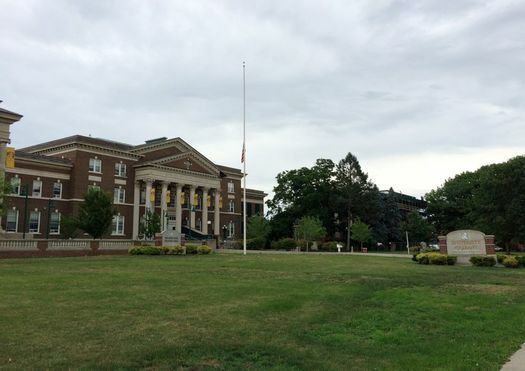 UAlbany is planning to turn it into a home for its new engineering college. In what way should the area around UAlbany's downtown campus grow in upcoming years? Are there opportunities for the city and university to set the stage for the neighborhood to evolve into a better version itself? Those are some of the questions at the heart of a new project announced Monday by the city of Albany and UAlbany to study the Western Ave/Washington Ave corridor along the university's campus locations in the heart of the city. 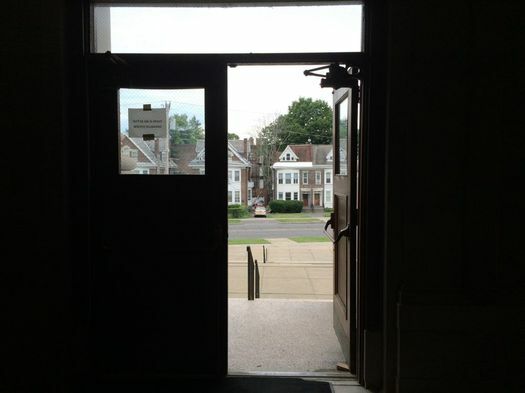 The process is part of the city's ongoing ReZone Albany project, and there will be events coming up soon at which the public can voice its opinions about which way the neighborhood should be headed. The study is being conducted to improve understanding of the area's needs, assets, and opportunities. 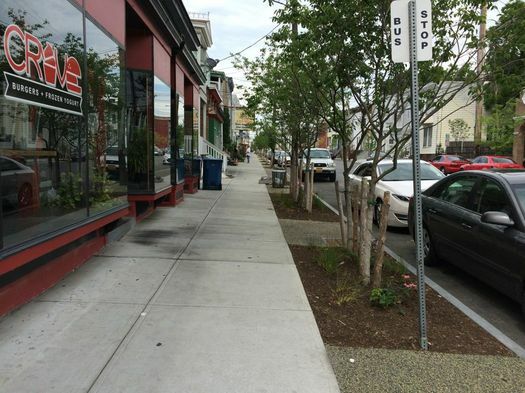 Aimed at giving the area a stronger identity, the study will address issues such as walkability, street beautification, parking needs, traffic calming and safety. The study will also review zoning issues in the area as part of Albany's Rezone Initiative being completed later this year. Said mayor Kathy Sheehan in remarks at press conference Monday on UAlbany's downtown campus: "This is an opportunity for us to step back, look at what the needs are of the university, of the residents, the needs of our businesses, so that we can make the right infrastructure improvements to truly help this neighborhood reach its full potential." Recently completed sidewalk reconstruction along Quail Street -- the project included permeable pavement. "When you think about the downtown campus, if you were a student and you were down here for classes and you had a little extra time, what would you want to do?" Spencer said to us. "Go get something to eat or maybe go beyond the campus. So it's really making sure those uses are there, that those linkages work, and making sure it's a comfortable pedestrian experience." This latest look at the neighborhood is being prompted in large part by the big plans UAlbany has for its downtown campus. 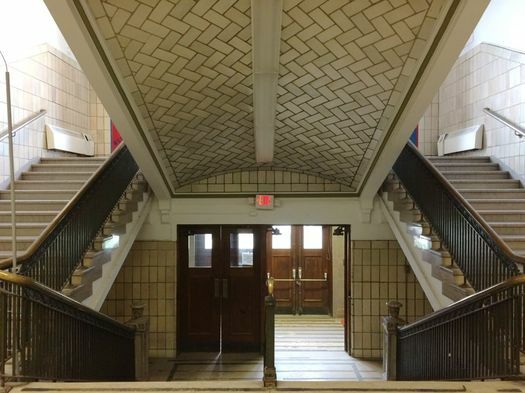 Specifically, it wants to redevelop the former high school building at the corner of Western and Lake into the home for its engineering school. The university is also looking at potential renovations at its Alumni Quad dorms a few blocks uptown on Western. Said UAlbany president Robert Jones Monday: "I don't think this engineering school can be all that it can be before the community is all that it can be, and vice versa." University officials have said in the past that one of the goals of locating the new College of Engineering and Applied Sciences on the downtown campus is to help its programs form links with the wider community. And Jones again emphasized that angle at the press conference. He also mentioned the intent to provide an affordable public option for engineering education in the region. 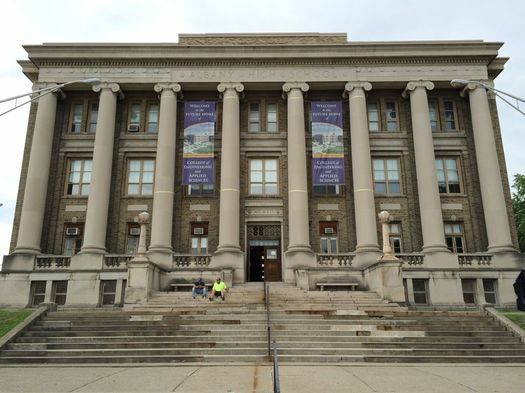 UAlbany figures the conversion of the stately, if somewhat rundown, old high school building will cost $60 million. It doesn't have the money for project lined up yet -- it's hoping to secure the funding through the state budget process. But it does have the $4 million for the design phase of the project, which has already started. And as John Giarrusso -- UAlbany's associate vice president of facilities -- explained Monday, they've already started on some of the more basic projects related to the building, like replacing the roof. He said when the design process is finished -- and the money is lined up -- the main renovation project would take about three years. But UAlbany recently passed one mile marker on the road to getting the engineering school up to speed: the state Education Department gave its formal approval to the school's new computer engineering degree program. All the sessions will be located on the downtown UAlbany campus (exact location to be announced). The consultancy heading up the sessions will be Dover Kohl, which handled the previous neighborhood-specific Rezone Albany events for the Warehouse District, Central Ave, and the South End. We get the impression these UAlbany sessions will be similar. One of the things that's interesting about this chunk of midtown Albany is that all the way from the Saint North and South Main down to Washington Park, the campuses of both Saint Rose and UAlbany are not just prominent landmarks in the neighborhood -- they are, in many cases, the actual neighborhood. There isn't the stark division between campus and neighborhood that you see many other places. In recent years Saint Rose has defined the identity of its neighborhood section more prominently, with new signage and building design elements. It'll be interesting to see if there's an effort or desire on the part of UAlbany to do something similar. But all those improvements will be blunted if there isn't also time and attention focused on continuing to cultivate social and cultural relationships -- and respect -- between the UAlbany community (its students, specifically) and the all-year residents of the neighborhood. Because we've seen what happens when that breaks down. Of course, that's not an easy thing to do. Friction between college students and residents is a longstanding issue, both here and pretty much everywhere else there's a sizable off-campus community of students. But it's worth the effort -- especially if the new engineering college ends up placing another thousand (or so) students in the neighborhood. What do you call this area? This general part of Albany is usually described as the Pine Hills neighborhood. But the subset that's part of this study also frequently gets tagged with the "student ghetto" label. There have been previous efforts to re-brand it -- for a while there was a push to call it the "Education District," and there was a fleeting idea to call it "NoMad" (north of Madison Ave). Of all the priorities on the list here, a neighborhood name is pretty low. But names can help shape perception, so it might be something to tack onto the end of the list. 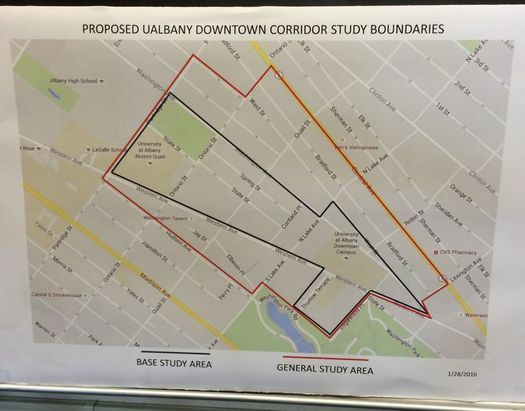 UAlbany conducted a study for the campus as an whole, including the downtown area. I believe that the suggestions included another building (not the old high school) on the wide open grassy area, along with a parking structure of some sort on the same space as the current parking lot. I am life- long resident & tax payer. We have a smaller taxable property base because of all the schools, state offices, hospitals & churches. I had hopped that the former Albany high would have been turned into condos. The amount of bars in the Pine Hills area contribute to noise, vandalism, and the general decline of the neighborhood! What about adding things that would attract Baby Boomers, and retired folks. We have R.P.I. in Troy for engineering. S.U.N.Y. 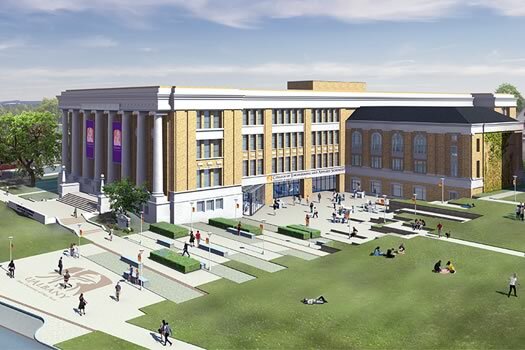 has lots of space on it's uptown campus to add more buildings! I got my PhD from the downtown campus, the Rockefeller College housed next door to the proposed engineering school. I lived for nearly 15 years on the park. This is and should be a hub for young people to live. I can't disagree more with the previous poster who says we need more "baby boomers" there and seniors. That's a death sentence (especially since boomers are at the youngest end in their mid-60s by now). It's also a place that is affordable housing for a large section of working class people in Albany. Very often these types of plans tend to really be about gentrifying out minorities and bringing in rich white folks. The logical step would be repairing and upgrading the housing while keeping it affordable (rent control and public ownership). Existing codes should be enforced to crack down on slumlords. Besides housing infrastructure being rebuilt and sustained, it will be nice to see the city ask the locals what they want in the community. Bike lanes and green space are very nice (and in the Quail-Ontario corridor absolutely necessary), but so are music venues and art galleries. Another thought would be the drinking age - though this is a state issue - should be lowered again to 18. This would be an easy way to decriminalize the ubiquity of drinking in student life and eliminate house parties, as students would then go to bars (which would pay taxes and build the community again). mg, if you're concerned about tax revenues do you really want to draw in demographics who are on a fixed income and typically use high levels of public entitlements (i.e. medicaid)? Ideally, the engineering school will help incubate businesses which will draw younger workers to live in the area. Sure, that's not guaranteed and it can be easily screwed up in any number of ways. 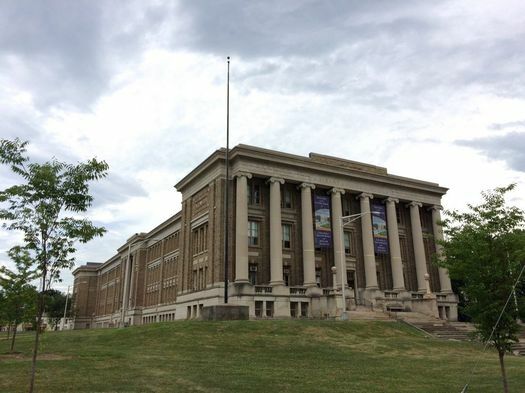 But it seems like the revitalization of Troy over the last two decades can be at least partially attributed to the influence and investment of RPI.